The 2015 Swedish Chess Festival took place from 11-19th July, at the Selma Spa Hotel****, in Sunne, Sweden. The highlight of the festival was the 2015 Swedish Championship GM-Group, which was played in a 10-player round-robin tournament. For the third time in the last four years, the champion was decided by a playoff match and it is no surprise that Swedish #1 player GM Nils Grandelius was involved for the second time. In 2013 he lost against GM Hans Tikkanen in a duel that went all the way to the final Armageddon. This time Grandelius maintained a full point advantage after the penultimate round, being ahead of GM Emanuel Berg, the other pretender for the title. Only the last-round duel between them should have decided the title. Berg needed to win and chose a “must win” strategy with the sharpest approach after 1.e4 e5, King’s Gambit Variation. After a complicated game he managed to secure the victory and take it all the way to playoff. 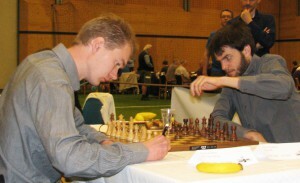 Nevertheless, Grandelius outplayed his opponent in the match to clinch the title. - I’m a different player now and it did not feel like I had any advantage of having played a playoff in the Swedish GM championship earlier. But understandably it hurts not to have done it before. And it could probably be good training for the future to play a playoff in a tight situation. Many champions are determined this way nowadays”, Grandelius says.